Bunion is a condition which leads to swelling on a joint of the big toe. Bunions don’t develop overnight and can occur because of several reasons. Since bunions are progressive in nature doctors recommend that they are treated ASAP to prevent the condition from worsening. You can get help from some of the best bunion braces available to get relief from uncomfortable symptoms. How Does a Bunion Brace Work? A bunion brace is a tool that can be worn day and night and works to effectively push back the toe to its original position. Bunion braces come in a variety of designs and variations. Each type of brace serves a different purpose with some only pushing back the toe while others pulling the big toe over. However, the effectiveness of the brace depends on the kind you look for which is why it is important to find the correct one. Most braces work by pulling away from the big toe from the second one. This allows stretching of the toe and tendon muscles. Medical treatments can be quite pricey which is why bunion braces can be used as a cheaper means of halting the condition from worsening. Top selling bunion braces have a number of categories such as a flexible splint, custom-molded and ready-made braces. Each differs in nature and hold qualities that allow the situation to be handled. Though bunion surgery does exist it is still recommended that bunion braces are used as surgeries can be costly, have a longer recovery period and are painful. Talking specifically about flexible splints, these can provide maximum benefits and are more effective than those worn just at night. Along with providing comfort, these can be worn easily and are almost unnoticeable. They come in different sizes and fit according to the need allowing you to walk properly. The main debate regarding bunion brace is that is are they really effective? Many researchers and doctors have suggested that the braces are effective in preventing bunions from growing. However, depending on the conditions the need for surgery may arise. When you seek to use a bunion brace, you are looking to find relief from conditions like pain, pressure, irritation, and swelling. Each case presents a different level of discomfort with more severe cases experiencing restricted mobility of the big toe. If the condition remains untreated, it may even lead to arthritis. Since bunions only get worse, it’s best to get help from a good quality bunion brace as early as possible. The use of a bunion brace effectively and successfully deals in preventing the growth of a bunion. Because a bunion can be quite hard to control and is progressive in nature, a high quality bunion brace is impactful in preventing the growth. Using a bunion brace is painless as compared to surgeries which are painful and expensive. Through a bunion brace, you can naturally recover as it allows movement of the big toe. Another advantage is that it allows you to carry out routine work and sleep at night without having to take it off. Most products irritate you or are a threat to the skin because of the material used. Bunion braces, however, don’t do this and are designed specifically to be worn at night. A bunion brace can help you feel great again by providing necessary comfort allowing you to walk easily and fixing the alignment between your toes. One of the major drawbacks concerning a bunion brace is the comfort level. Some aren’t as comfortable as they should be and can really disturb night’s sleep. Others may be too bulky to wear with shoes. This is why you have to be careful when selecting a bunion brace as the quality really matters. 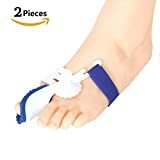 For your ease, we have listed down the top-selling bunion braces on Amazon that you can purchase to cure your toe problems. A bunion splint can be used to provide all the protection and support that you need to fix your toes. This splint comes with soft gel protectors that are present to provide constant support and reduce pressure on the big toe. This allows the alignment to be fixed and also slows down the progression of bunions. The product further contains two gel bunion protector sleeves that are perfect to wear even during sleep. This product is perfect for use by active individuals and a great choice for all those who wish to recover quickly. The main aim of this splint is to reduce all kinds of discomfort and pain. Using this product will provide you relief and help reduce inflammation. The brace is lightweight and breathable meaning it allows air to pass in and out. It can be used at day and night. For securing it comes attached with an external elastic strap. It can also be worn with most shoe styles and can be worn easily even with socks. This splint is washable and has a latex-free gel that offers protection and support. The product comes in different sizes and can be accommodated according to the size of the foot. Customers who have purchased this product find it to be useful as it comes with an entire kit that can be used in many different ways to fix the alignment. They have further stated the product is effective in dealing with pain. This bunion split is designed to provide protection and support allowing you to walk properly without feeling pain. This splint comes with an aluminum brace that provides constant support and gently puts pressure on the big toe thereby trying to realign it. 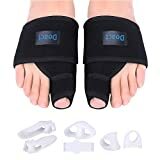 This allows development of the bunion to be halted. The product can assist in reducing pain and discomfort that can be caused by bunion and also works effectively to reduce inflammation. It is lightweight, breathable and durable, comes with an elastic strap that can be worn easily. This brace is suitable for use with many shoe styles and can be worn day and night. It is available in flexible sizes that allow it to fit easily and be adjusted. Customers who have used the product have said that this is a very useful product that provides a comforting experience. They have further stated that after using the product they were no longer limping and have called it one of the “best splints”. Furthermore, they like the quality that the splint can be adjusted easily allowing easy movement to take place. They said that this product works great. Designed with soft material to provide maximum support, this product is among the best bunion braces available. The main function and aim of this bunion brace is to provide relief fixing overlapping toes without the need of considering surgery. With this product you will be able to walk perfectly again and indulge in activities you love to do such as cycling, running and others. The brace comes as a one-size-fits-all option making it suitable for all kinds of feet. The Velcro strap allows for easy adjustability, giving you just the right amount of tension or release required by your foot. Customers who have used the product have found it to be durable, reusable and a wonderful product which has made their life easier by allowing them to walk. 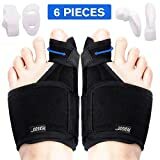 They have also talked about the comfort provided by the product, how easy it is put these on and that it stays well in place. This bestselling bunion brace is available to provide a comforting experience and is among the most popular products. When this bunion splint you will get the instant relief you are looking for and will be able to walk again without feeling any pain. Wearing it daily will fix your toe alignment and push back your toes to their original position. It also helps get rid of bunions that once developed growing at a fast rate. Whether you have a sports injury, arthritis or are suffering from any other condition, this product can help transform your life by eradicating the pain. This splint is available in different sizes making it suitable for use by children and adults. The product comes with a 15-day guarantee boosting your confidence that the product is worth giving a try. Customers who have used the product have described it as a lifesaver. They have said the product can be worn at night and can be adjusted easily. The product provides instant results allowing you to feel great again. The flexible design allows you to walk if you walk in the middle of the night. 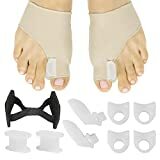 This product comes with a pair of bunion splints along with 3 pairs of gel toe straighteners. The product is suitable for use even barefoot and the latex-free straighteners can be worn with socks and shoes during the daytime. With the use of this product, you can say goodbye to bunion surgery as it finishes the need. This is a more painless and pocket-friendly way of getting rid of unwanted bunions. You can wear this bunion splint all the time to bring about maximum comfort. The bunion splint comes with in-built aluminum that provides pressure on the overlapping toe gently thereby allowing the alignment to be fixed. The soft gel separators that come equipped help by reducing discomfort and slow down development of the bunion. Bunion splints by DOACT have soft layers, are made from breathable material and provide complete comfort. The toe straighteners are made using 100% medical grade silicone which isn’t at all harmful to the skin. The kit is washable and comes in different sizes. Customers who have used the product have labeled it a must-have product. According to customers, it is a lightweight product that provides the necessary comfort. This bunion splint by Waterfly is durable and wear resistant. Crafted to perfection, this product has a smooth finished and is long lasting. It comes in different sizes allowing users to easily adjust their foot. The hook and loop closure is adjustable meaning it is suitable for use by all. The product comes enclosed with a supporting spring that is present to make it easier for you to walk. The spring helps reduce pressure and inflammation thereby providing a complete pain relief. Made using a soft and breathable material, this product is not harmful for the skin. It can be used day and night and is effective in properly aligning your toes. People who have conditions such as arthritis or have encountered sports injuries can use this product to fix abnormal walking. The ultra-light fit allows the product to be used at night without causing any problems. Customers who have used the product have found it to be very comfortable and have appreciated the features such as breathable and light-weight material. They have also talked about how soft this bunion splint is and that it is easy to use. The product provides excellent support to the foot alleviating the pain and fixing the toe pushing it back to the original position. These are some of the top selling bunion braces available to realign your toe and take off the unnecessary pressure. You can also try other tips like icing the bunions before and after using the brace to lower inflammation. Or you can wear shoe inserts to distribute pressure evenly when walking.